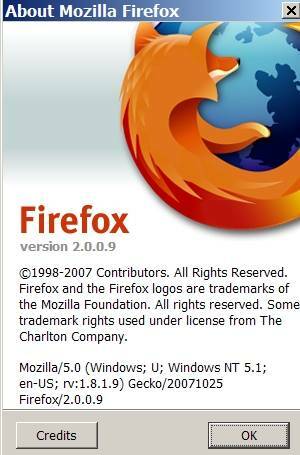 There are now two major ways of looking at web pages, the normal one is Internet Explorer and the techie new way is Firefox. This new viewer of web sites now has about 30 percent of the market. 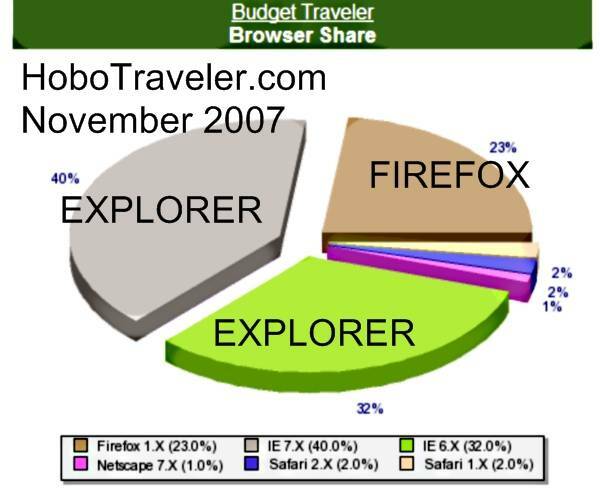 70 percent for Explorer by Microsoft and Firefox can have the rest. I think the consumer, my readers; the general public suffers when people like me who like technical, computer savvy, fun toys…. When we play around too much….! What works on Explorer does not always work on Firefox. I am trying to figure out what is Politically Correct, I think I must keep the Firefox people happy, and the Explorer people will be very happy. Politically Correct people what me to walk on eggshell, they want me to use the perfect words, never stray and obey. Funny part it they think they are liberal, they are not liberal, they are so strict in what I have to do it annoys me, I am not so conservative I need to judge you if you use the wrong words. I personally consider Firefox a nice toy, however many pieces are broken, and I must continually configure, fix, and repair. The toy is simple and boring to fix, I really do not want to sit around fixing configurations, and I do not get a rush by playing with a program. I am 110 percent sure I can learn any computer language fast, but it is very boring. I have decided to change to using the Firefox Browser, not because I think it is better, I think it is slower, breaks too often, and confusing, they are not sharing and trying to work with everyone, they want to be Microsoft. However, because the MTV, too techie, need play toy world is using this play toy. I need to fix my web pages so this politically correct browser will accept them. It does not forgive, it is strict, not liberal, it does not allow for any human errors. A techie would say first, … you are using the wrong version. Updated and new version of Firefox… Ok, my internet pages have problems, and this is why I am trying to use Firefox, to test and see if the pages work well. I am small guy; I am not Yahoo.com or Youtube.com. 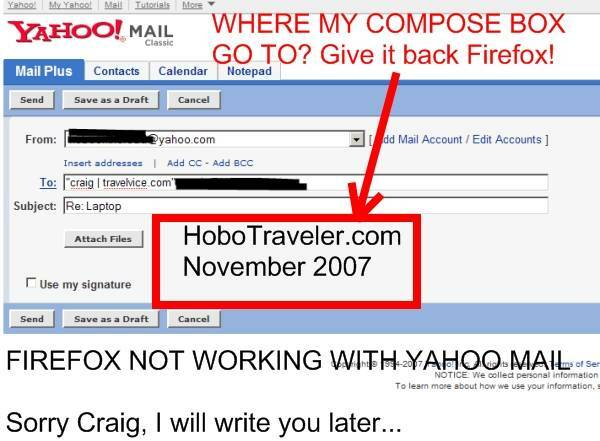 I am using Firefox today and first I cannot reply by email using Yahoo Mail to Craig at Travelvice.com. I see someone posted a message on Youtube.com. I want to turn off this option on YouTube.com, I do not want to play. I do not want two blogs. I do not want to be social, but…. This is a quick way to get on you tube so I will take the path. Where is the mosquito net video? I refresh, reload, etc and nothing works. Do I have to go open in Explorer to get the job done? Yep. This is how life is folk, when you start a business, do the same job as your competition and when you can do the same, improve on it. All I want is the same same, not different first, and then show me the other toys. I am very good at learning boring programs like Firefox; the world should not have to be techie to use a program or a look at my pages. I was looking at an SEO page, Search Engine Optimization page, the print was so small I had to get my glasses. I thought, empathy impaired bunch of jerks. 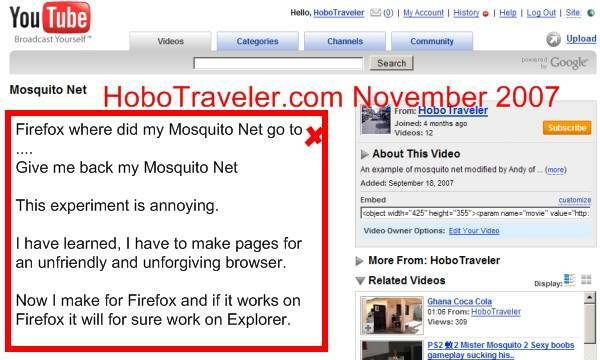 I can understand Firefox not showing the HoboTraveler.com page badly, this make sense, However, not showing Yahoo and YouTube.com is weird. It is possible the Firefox people do not know things are missing on the page? How do you know something is not working if you cannot see it…? I know my pages, I can see when something is just missing, some techie in Gestapo methods made the decision. AOL does not need emails from Nigeria, the new world. Techie Politically Correct and Gestapo Techie Tactics. Play our way or we call you stupid. I am good on computers, you go to Togo, Ghana West Africa and make pages on the fly over a cell phone connection. I can, can you? Trust me, if I do not have a hammer, I will make a rock work. I think I sort of look like MacGyver.